Today, end-of-life choices are trending towards cremation over traditional burial for a variety of reasons. In NH, more than 70% of people choose cremation for their final disposition. The lower costs associated with cremation are often a factor in a person’s choice. And, while cremation does tend to be a less expensive alternative to a traditional burial, there are still many options and associated costs to consider. One of those costs is the cremation urn. How much you choose to spend on a cremation urn is completely up to you. Whether you are planning for yourself, or searching for an urn for a loved one, there is no shortage of options available. At Phaneuf Funeral Homes & Crematorium, we offer many types and styles of cremation urns, depending on your wishes and budget. Our cremation urns are made from various materials, both natural and man-made, and range from simple material and design, to complex and costly cremation urns. When choosing an urn, there are a few things to consider. For example, it’s best to consider where the urn will be kept when determining the style and material of the urn. Will it be displayed somewhere or buried? Metal urns are a great option for those looking for a durable urn for either burial or to be displayed in a home. They are made from metals including steel, copper, bronze, pewter and brass, and can be finished with a variety of techniques. Cultured urns are another type of durable cremation urn, which are made from various synthetic materials. They are meant to look like urns made of products like wood, bronze, granite, ceramic, or marble. These urns can also be easily formed into unique shapes and colors, since they are created using man-made materials. Quarried urns are a nice choice either for a burial or to be kept in a home. They are made with natural stone materials, including marble, granite, onyx, quartz, slate, alabaster and fossil stone. Because the materials used to craft these urns come from all over the world, each urn is completely unique, and as such, they are often a more expensive option. Cast bronze urns can be made using standard casting techniques, as well as with lost wax or sand. Bronze is an alloy of copper and zinc or tin, which makes it very durable. Therefore, is often used for sculptured urns. It is a popular choice for artists who created memorial urns, and they are often chosen when the urn will be on display in a home or cemetery. Wood urns can be made from almost any type of wood. Some of the most common types of woods used to make cremation urns include: cherry, maple, pine, oak, walnut and poplar. Other types of wood, which are not as commonly used, include: mahogany, paduk, yellowheart and zebrawood. This type of urn is typically chosen for display in a home or cemetery columbarium. Ceramic and glass urns can be made using a variety of artistic processes, such as glazing, coloring, firing, and glass blowing. Urns made from ceramic or glass tend to be quite delicate, and as such, are often chosen for display in a home or cemetery columbarium. For a more environmentally-friendly urn option, there are a variety of choices available as well. These types of urns are made with recycled and natural materials, and break down when placed in water or, over time, when buried. If you plan to bury an urn, you may also choose an urn vault for further protection. Phaneuf offers a few different styles and models of urn vaults, depending on your preferences and availability. Families also have the option to choose no urn when choosing cremation services. If an urn is not chosen, family members may provide a suitable container to hold the cremated remains, which must be at least 200 cubic inches in volume. Or, the cremains will be delivered in a nondescript plastic box, which may be a good choice for a family considering scattering the ashes. 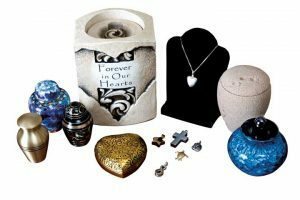 For those looking for a special urn that doesn’t fall into any of the categories listed above, there are additional urn types available – usually limited only by your budget and imagination. Phaneuf Funeral Homes & Crematorium offers several categories of specialty urns, some of which include: veteran and patriotic urns, urns for infants and children, double urns, custom urns, and more. Each of our specialty urns can be crafted from various materials, depending on your preferences. You may also choose to add laser engraving to your urn. Phaneuf offers in-house laser engraving for further personalization of urns and other keepsakes. 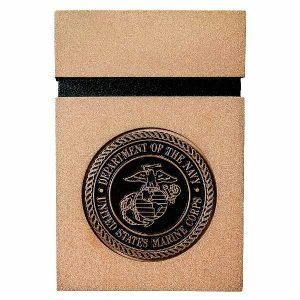 In addition to the main cremation urn, to be buried or placed in a home or elsewhere, some people like to keep some of the cremated remains in a small keepsake urn or wearable pendant. They are often made to match the color and style of the cremation urn, and are commonly made from materials such as gold, silver, brass or pewter. The cost of the urn will ultimately depend upon the material and style of the urn. The more complex the design, and the more durable and/or rare the material, the more expensive an urn is likely to be. At Phaneuf, urns can be purchased individually, or as part of a cremation package. Most of our cremation packages include your choice of an urn. Please see our general pricing list for more details. Thank you for the post on what to know about choosing a Cremation Urn. I really like the idea to have a biodegradable Urn you can bury. Maybe one that uses your ashes to help fertilize a seed would be a nice idea. Thanks for sharing this valuable blog post regarding what to know choosing a cremation urn. You have shared the all types urns and what material are used. Keep sharing this kind of information!! I’m pretty positive that I want to be cremated after passing away. This is something I’ve been thinking about since I want to plan my funeral early. It’s helpful to learn that the cost urns depend on the material and style of the urn. My friend recently passed away and requested to be cremated. I have never had anyone close to me be cremated before, so this is all new to me. I appreciate your advice here on the different urns, especially that urns can be made out of wood and that they are nice enough that they can be displayed in a home or in a columbarium. My friend’s family wants to keep the urn at home, and she loved wood and woodworking, so a wooden urn would be perfect for them!